Wow, this Super Jeep was a joy testing at Club Motorsports in Tamworth, New Hampshire earlier this week! 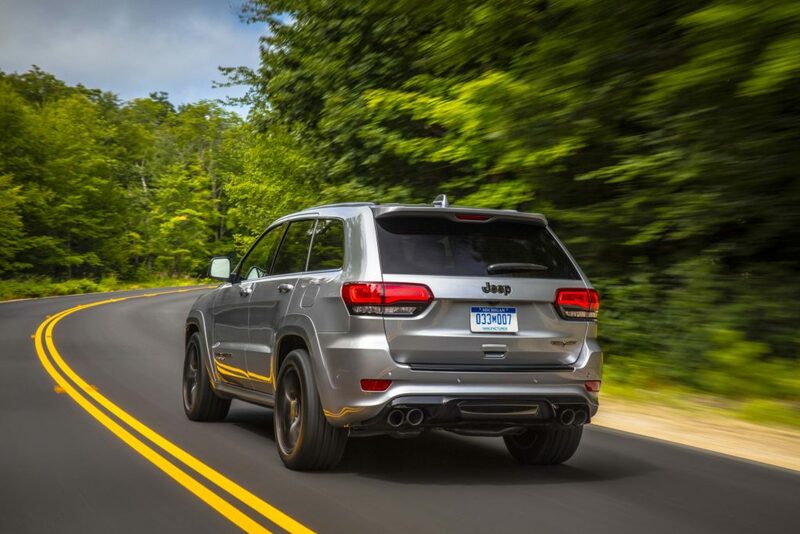 Detonating 707-horsepower and 645 lb-ft of torque the 2018 Jeep Grand Cherokee Trackhawk is the most authoritative and swiftest SUV roaming the streets. Only when you depart the vehicle and look back do you realize you were just warping around the raceway in a sport utility with the strength of J.J. Watt and finesses of Odell Beckham Jr! The Trackhawk is special, an anomaly in the automotive world. It allows you to feel an insatiable sense of freedom behind the wheel while providing a temporary reprieve from all the stresses, ills and struggles life may bring. 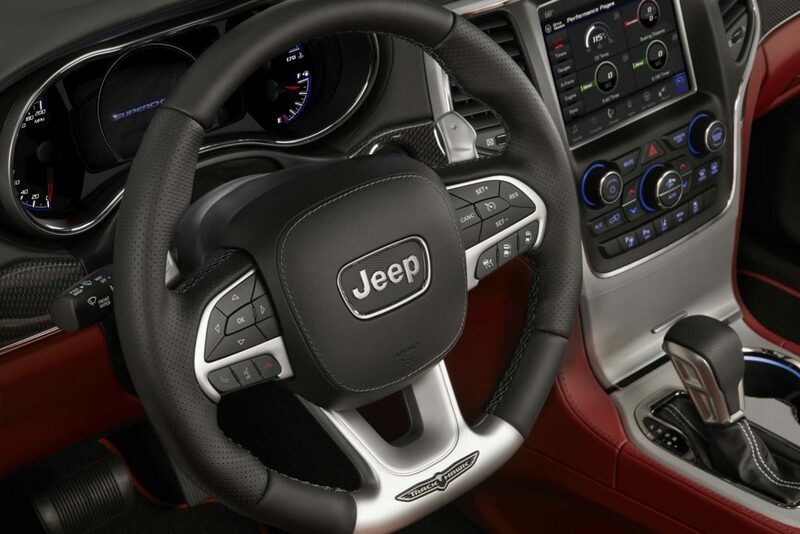 With near supercar firepower the Jeep’s supercharged 6.2-liter V8 engine and upgraded TorqueFlite 8-speed automatic transmission (developed to handle the massive torque loads) gives it the capabilities to explode from 0 to 60 mph in 3.5 seconds, run the quarter mile in 11.6 seconds and reach a top speed of 180 mph. However, during “Launch Control” demonstrations the Jeep clocked itself at 3.4 seconds on both my runs. Additionally, SRT engineers outfitted the Trackhawk with new Brembos which help achieve a braking distance of 114 feet from 60 mph. The package consists of two-piece, 400 mm vented aluminum rotors up front, 350 mm rears, yellow 6-pistion front calipers and 4-piston rears. Keep in mind Jeep is no stranger when it comes to enhancing rock crawlers with elite aptitudes. 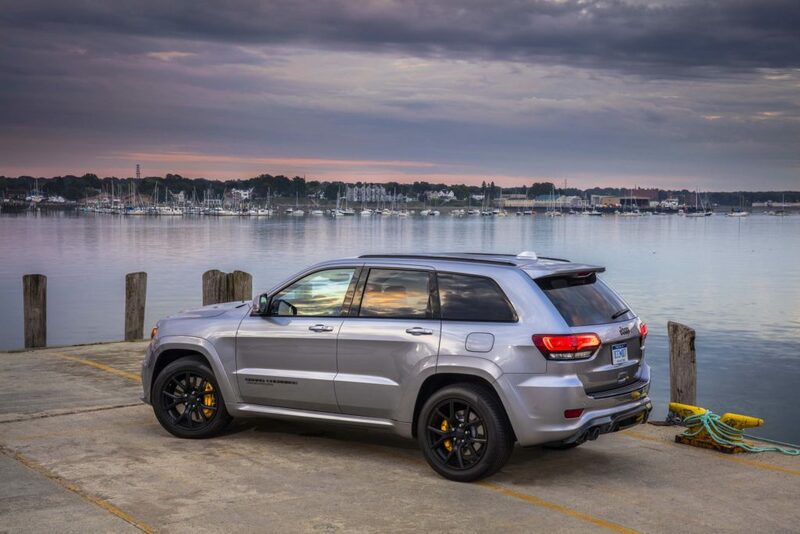 In 1998 the first performance Cherokee was released and in 2006 the Grand Cherokee SRT was born to run with 420 horsepower and continues to live on. SRT aka Street & Racing Technology is the performance group of FCA and transforms their base models into superheroes such as the Charger and Challenger Hellcats of which the Trackhawk shares the same engine, albeit with modifications. The only foreseeable downside to this grandiose engine is the 11 city MPGs. Sport Mode reduces shift times by 50%, steering is heavier and the Jeep Quadra-Trac 4WD system sends 65% of the torque to the rear. In Track Mode the suspension is at its firmest, ESC is partially cut off and 70% of the torque is sent to the rear. Tow Mode is specifically set for towing up to 7,200 pounds and sends 60% of the torque to the front wheels. Snow Mode cuts power to 500 horsepower and torque split is 50/50. Aesthetically, the Trailhawk isn’t as menacing as one might imagine. Think of the Dodge Demon for example. Although SRT engineers said this design decision was intentional the SUV certainly sounds and feels like 707-horsepower, especially after 3,000 rpms when deep-throated growls are released through the new, non-active exhaust system. The Jeep is outfitted with either standard 20×10” Titanium-finished Trackhawk rims or the optional Black Satin SRTs wrapped in either 295/45ZR20 Pirelli Scorpion Verde all-seasons or Pirelli P Zero three-season tires (not for winter) which are extremely capable and have amazing lateral grip. Quad 4″ exhaust tips embedded in a Gloss Black valance, body-colored wheel flares, aggressive front fascia with air damns, a unique hood with nostrils and Trackhawk badging notifies onlookers that you’re riding in something special. 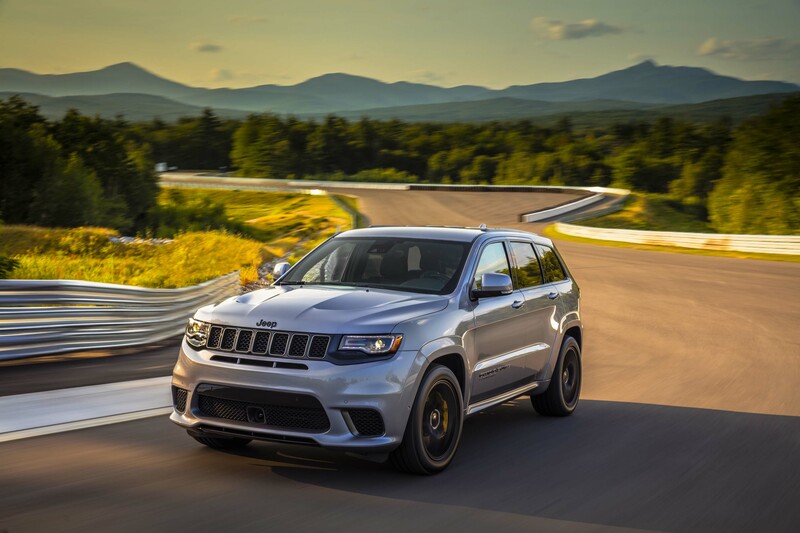 On the 2.5-mile road course the Trackhawk is inherently talented and performed gloriously in Track mode. Laced with balaclavas and helmets I felt just as confident in this SUV as I would have in a sports car. Its power flew up the 250-foot elevation changes with no lag and the Bilstein adaptive damping suspension (ADS) technically adjusted to Club Motorsports’ 15 meandering, downhill turns and apexes. Down the front stretch I was able to hit 122 mph before assertively braking and entering turn one. Trust me, weekend warriors are certainly going to enjoy the recently paved Club Motorsports. Inside I was treated to the Black/Dark Ruby Red Laguna leather package (Nappa leather trim is standard), bolstered performance seats, 19-speaker Harman Kardon audio, carbon fiber trim, dual-pane panoramic sunroof, a thick, flat-bottom steering wheel with paddle shifters and the 8.4” Uconnect 4 infotainment package with Trackhawk Performance Pages, seamless WiFi connectivity, Apple CarPlay and much more. The rear features two USB connections, heated seats and 115 V AC outlet. Available at the end of the 4th quarter expect to pay around $85,900 ($99,965 as tested) for your new toy pet and revel in every moment. Forget dragons, Game of Thrones’ Daenerys should swap out her flying fire starters for a Rhino hued Jeep Grand Cherokee Trackhawk. It will get her to Westeros much quicker, and in far more comfort.